I Am Number Four | What YA Reading? I don’t know if I’ve acknowledged this before, but I’ve never been a fan of science-fiction. I’ve never liked E.T., couldn’t get through Frankenstein, and even though Journey to the Center of the Earth has cute actors, it bored me. I am Number Four is surprisingly different. First of all, I love the planet Lorien. I love the lush nature scenery, the way the community works and the Loric animals (although how a certain species can change their nature was never explained scientifically, which bugged me. I don’t care how far-fetched the explanation is, as long as there is one.) Having exceptionally good grandparents, I love how the Loric let their parents raise their children so they can help society advance while they are still young and capable. I love how the Loric were smart enough to reverse the pollution of their planet while they were still able, and how the planet, being a living thing, rewards half of them with super powers deemed Legacies. I love this planet. Did I mention that the Mogadorians trashed Lorien and now all that’s left is a pile of rubble and that I’m only getting this information from the characters’ memories? There are 6 Legacy-using Loric still alive. They live on Earth. And they are hunted. John Smith, the main character, is one of these Loric. He is just coming into his powers, which are, admittedly, one of my favourite parts of I am Number Four. I enjoyed watching him harness his Legacies and was surprised at the variety of possible powers. I do have a few questions, though; what determines the Legacies that a specific Loric gets? Personality traits? Genetics? Destiny? I am very attached to some of Lore’s characters, specifically Henri (John’s guardian) and Bernie Kosar (John’s dog). Henri, especially, has an outstanding passion for getting John back to Lorien and an overwhelming love for John himself. He is portrayed as wise and stays true to himself throughout the book. I cannot say the same for 2 of the other characters. One character in particular has a sudden change of heart 3/4 of the way through the novel. This is never fully clarified and seems to have happened for no other reason than convenience. Aditionally, I found that I am Number Four lagged somewhat towards the ending, going a full 8 pages without dialogue (8 pages! Who does that?). I couldn’t take it and repeatedly put the book down because of boredom. Other than that, though, the book flowed well. One more aspect of this novel bugged me: It is written in the 1st person from John Smith’s point of view. The author is named Pittacus Lore. 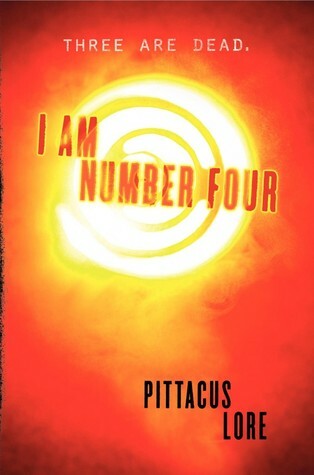 Pittacus Lore is a character from I am Number Four. Doesn’t anyone else see anything wrong with that? And then there’s the cliffhanger ending. Man. I don’t think that I’ve ever read a book with such a cliffhanger ending as I am Number Four. In order for this cliffhanger to exist, however, I feel that John has to betray his character by not obeying the very important words somebody whispers on their deathbed with their dying breath, due to ‘not having the heart to do it now.’ I mean, come on! Doesn’t that seem just a little too planned out? All in all: I am Number Four was okay. Not horrible, but not a book I’d read again. I’ll definitely read the sequel, but in my opinion, it should never have been made into a movie. There are far better books for that. 3.4/5 stars.